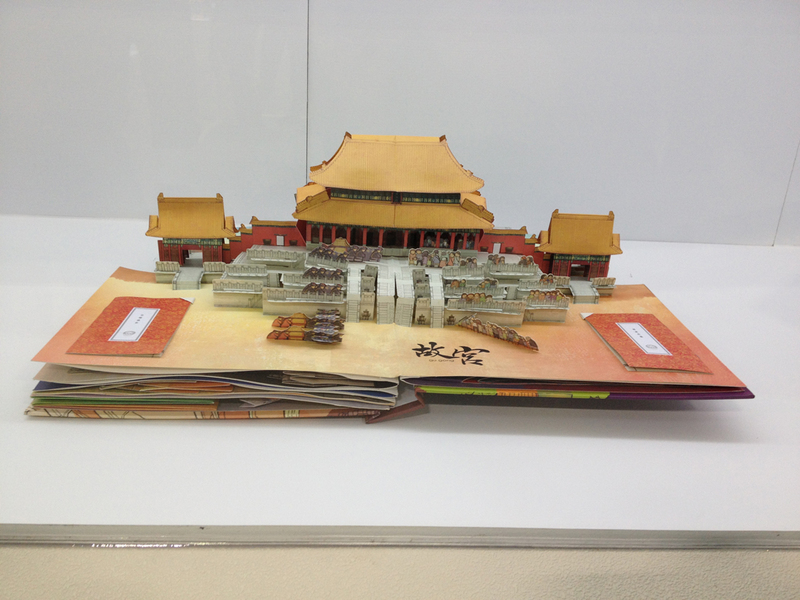 I've recently had the pleasure of traveling to Taiwan in support of über pop-up collector Michael Yang's, The Stunning Pop-Up Book exhibition. 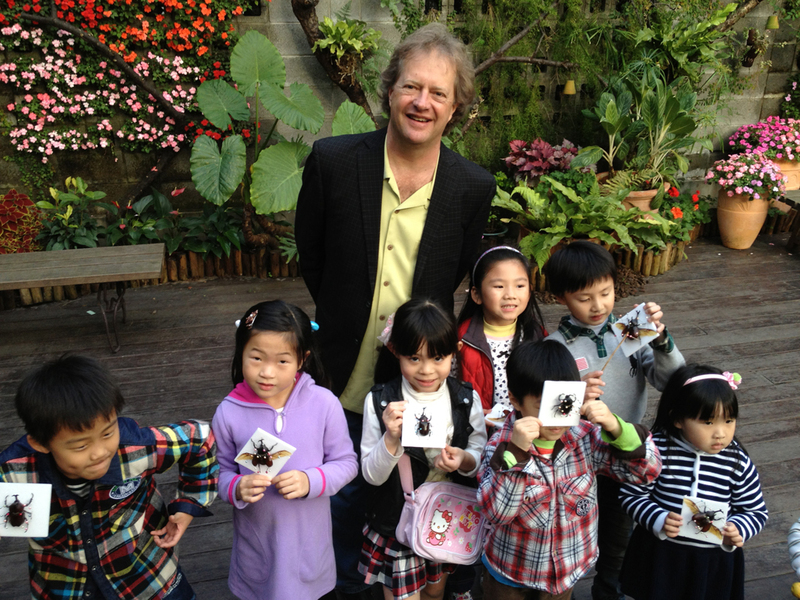 This was my second trip to Taiwan with the exhibition and I visited two new cities, Taichung, in central Taiwan, and Kaosiung in the south. The trip was sponsored by United Daily News Group and their affiliates. My hosts were very gracious and fun. I enjoyed the trip very much and the food was incredible. Hotel One with a temple in the foreground. The old and the new. 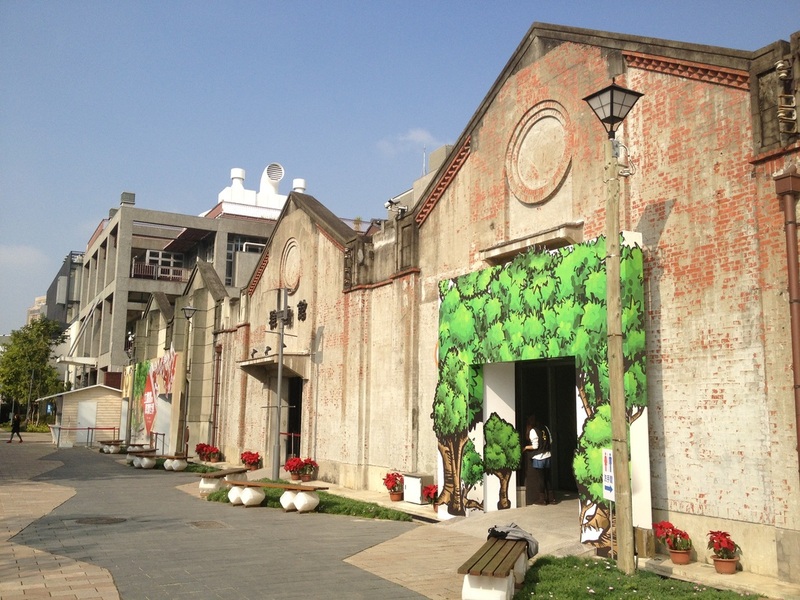 The venue for The Stunning Pop-Up Book exhibition in Taichung is a restored brewery. 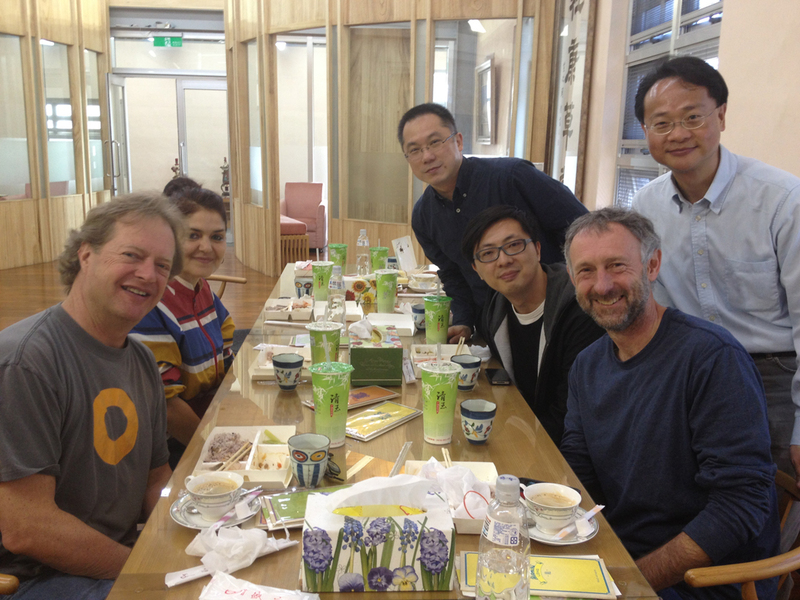 David Carter, Marion Bataille, David Yang, Kit Lau, Ray Marshall and Michael Yang. At the press conference, Ray Marshall, David Carter, Marion Bataille and Kit Lau. Day two, outside the exhibition. 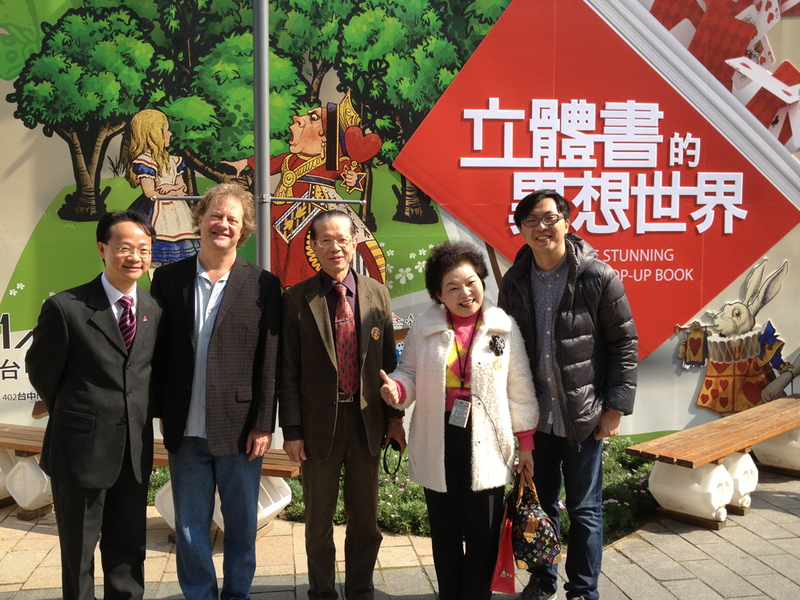 Michael Yang, David Carter, a collector and his wife, Kit Lau. 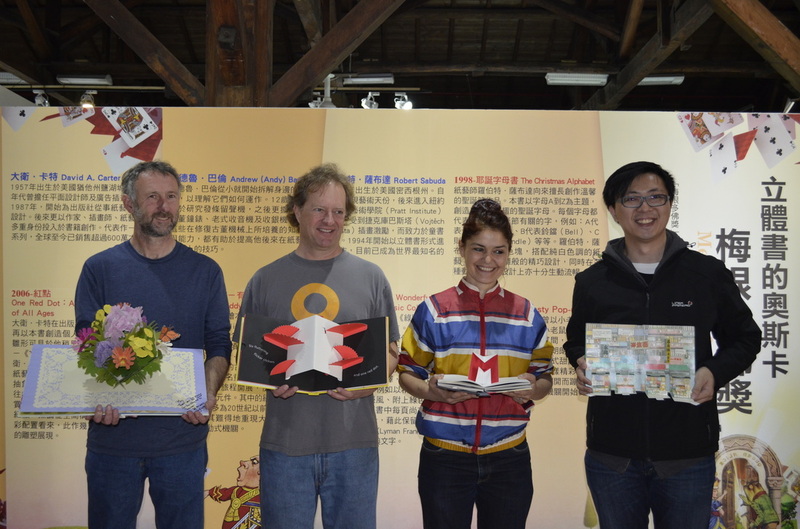 It just so happened that the pop-up artists, Mairon Bataille (Paris, France), Ray Marshall (Oakland, CA) and Kit Lau (Hong Kong) were in Taiwan at the same time, so the very nice people at UDGN held a press conference and a lunch for these visiting artists at the exhibition. 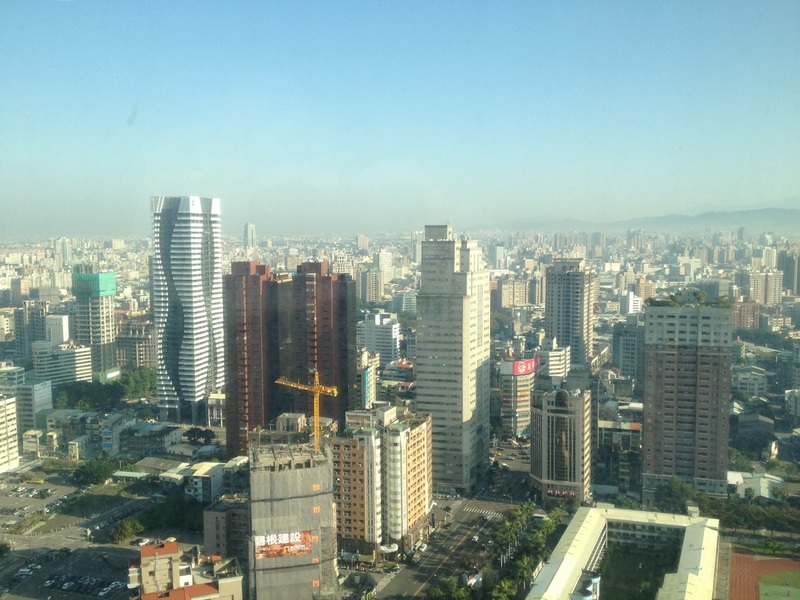 I had just traveled 14 hours on China Airlines, then another 2 hours by car to Taichung. I could barely say my own name, let alone answer questions in a meaningful way at the press conference. 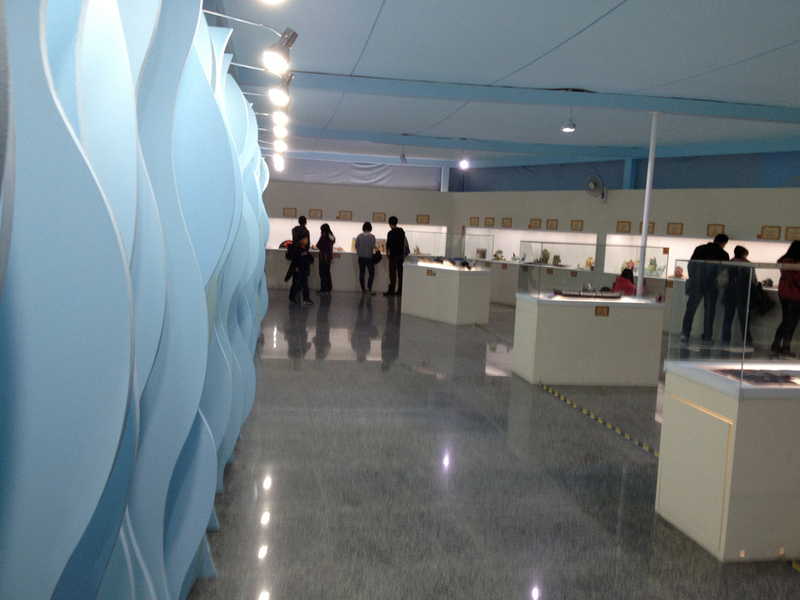 The Modern Art section of the Taichung exhibition. Pelham's Trail and my Red Dot series. 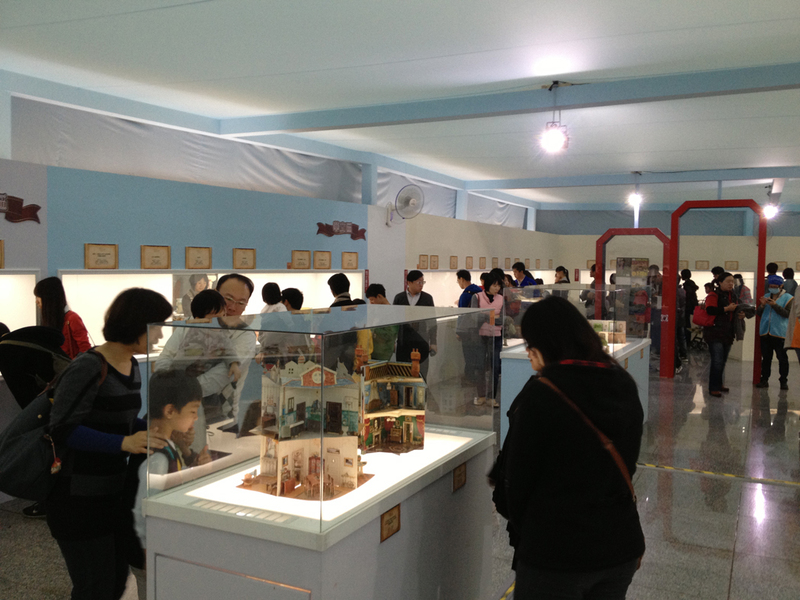 Kit Lau's pop-up about China. Paper lanterns in the window of the very good restaurant in the Gong Yuan Eye Clinic. 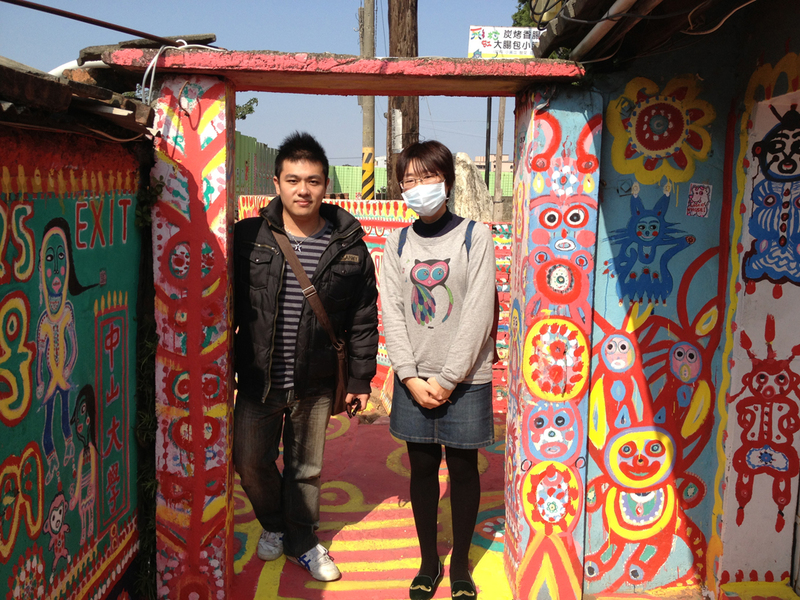 On my free day with Leo, my translator, and his friend Emily at the painted house. 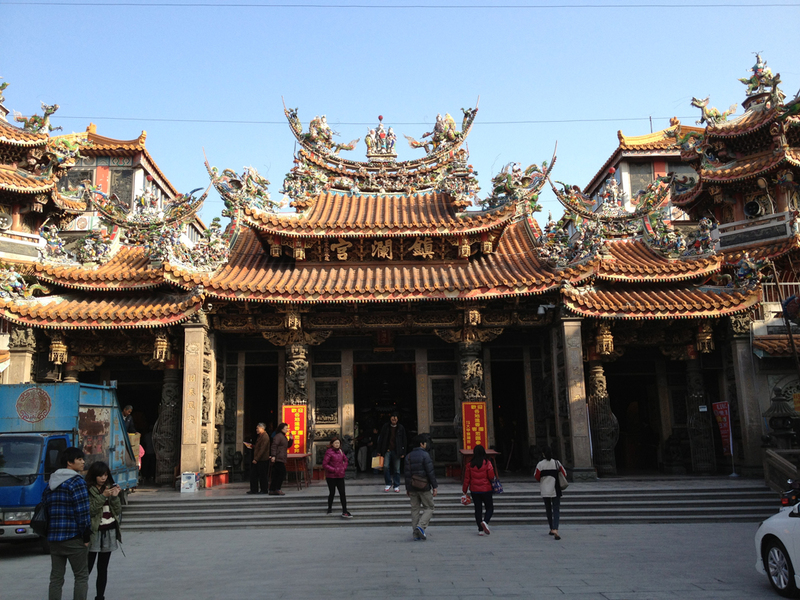 The temple for the Goddess Mazu, who protects fisherman, in Emily and Leo's home town of Daja. Inside the temple for Mazu. Beautiful flowers are everywhere in Taiwan. New friends and their afternoon handy work. A close up of the children's handy work. 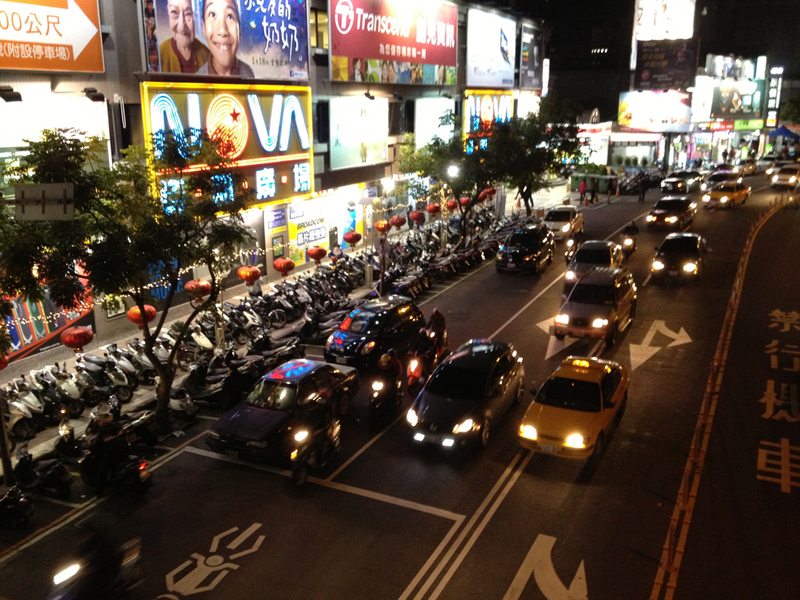 Taiwan is a bug lovers paradise. I really like the colorful pins the children use to mount the insects. 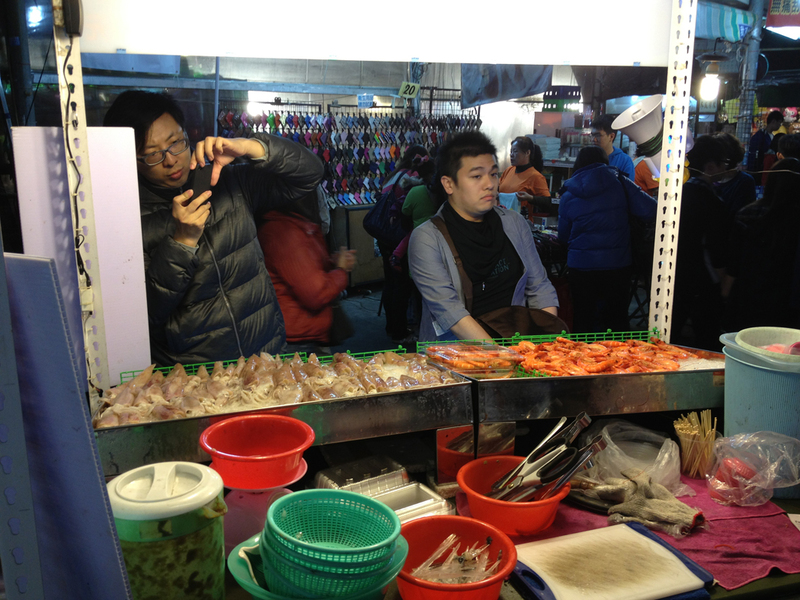 Kit and Leo at the Taichung night market where you will find all kinds of meat on a stick. Kit, Leo and I take the high speed railway from Taichung to Kaosiung. It's about a two and half hour ride. I love high speed trains. 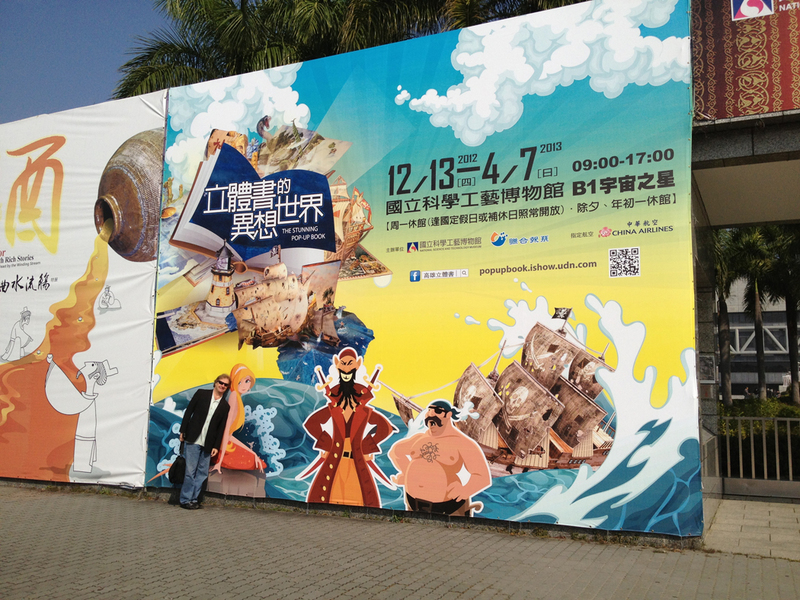 The graphics fo the Kaosiung exhibition. The theme was Technology and the Sea. 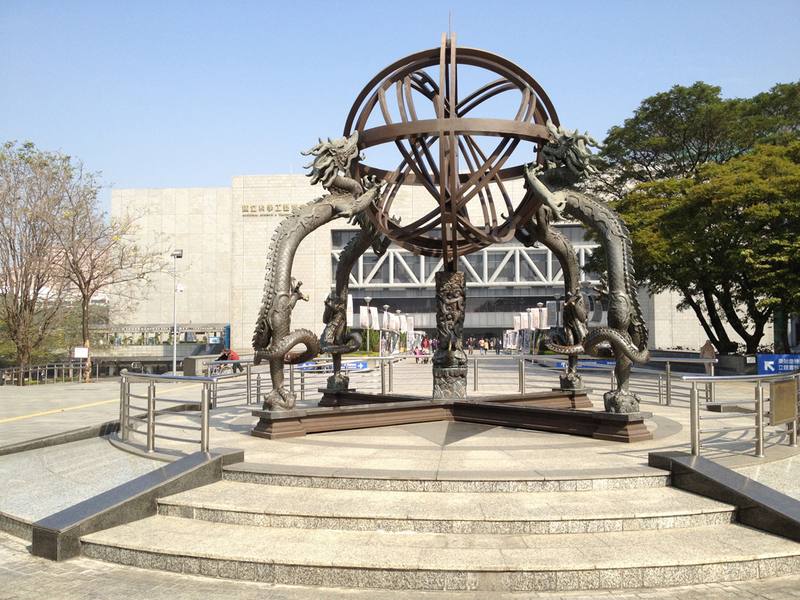 The venue for the Kaosiung exhibition is the National Science and Technology Museum. 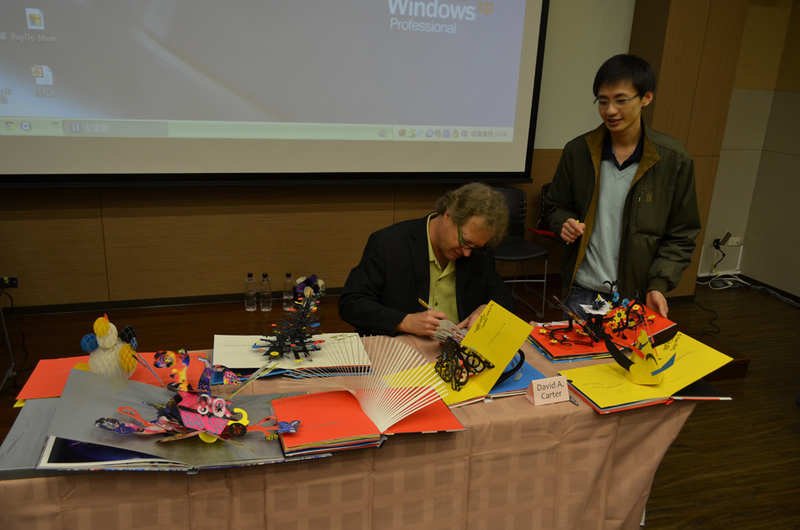 Signing books after my presentation. 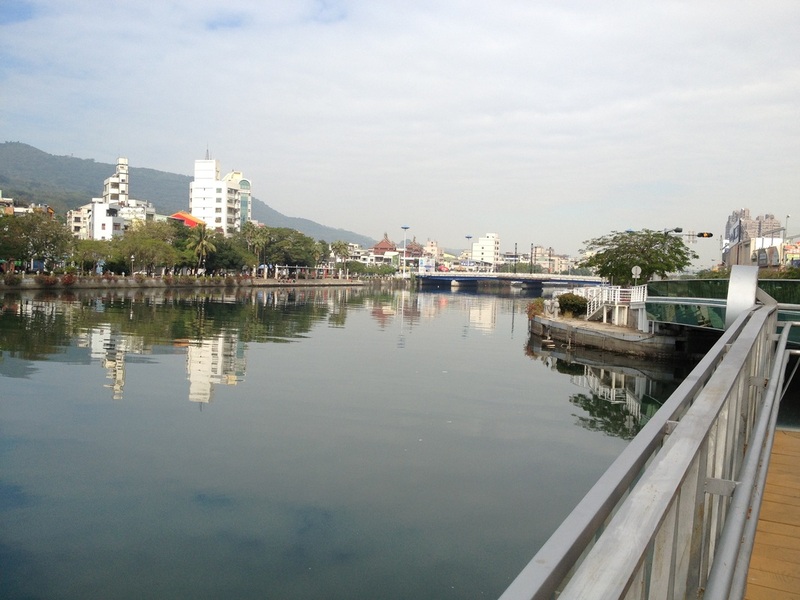 And on my last day in Taiwan, a walk along the Love River, Kaosiung. I've just returned from a wonderful trip to France to promote my newest title, Cache Cache (French) or Hide and Seek (English). I started in Paris, where I was the guest of my French publisher, Albin Michel. I signed and held pop-up workshops at two Paris bookstores, Chantelivre and Space 104. 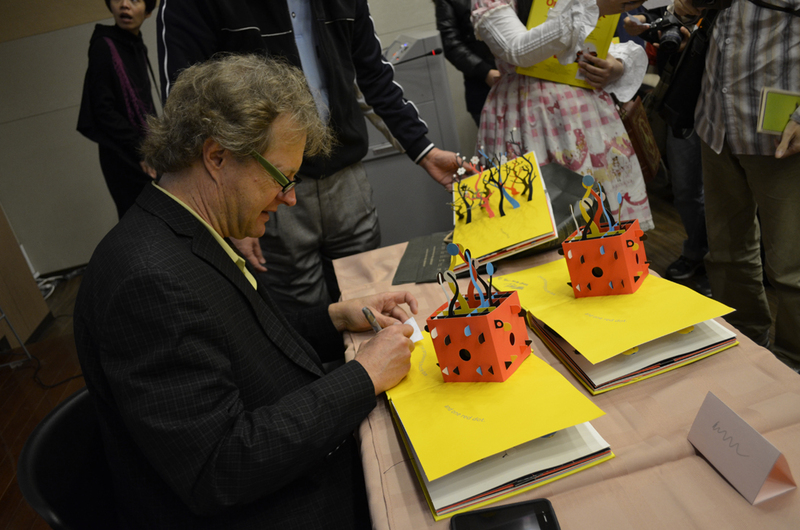 I then went on to the main Paris event, the exhibition and signing at La Boutique du Livre Animé, as the guest of Jacques Desse. 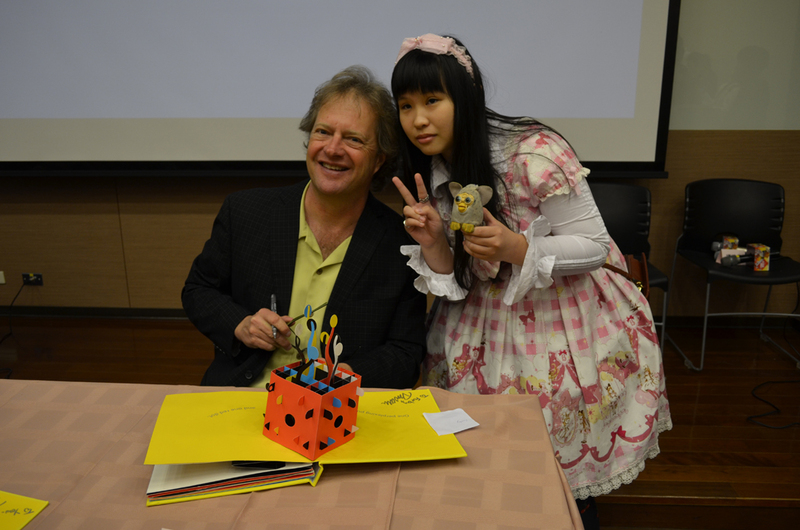 At this signing, I had the honor of meeting a rising star in the world of pop-up, Marion Bataille, the author of ABC3D. Please visit http://boutiquedulivreanime.blogspot.fr/2012/10/david-carter-paris.html and http://boutiquedulivreanime.blogspot.fr/2012/10/pop-bugs-exposition-retrospective-david.html for more photo's. Bye the way, the oysters in Paris were incredible. Next, I traveled by high speed train to Marseille, where I was the guest of Librairie Imbernon, and the public library BMVR Alcazar. In Marseille, I had the opportunity to stay at the Unite d'Habitation Le Corbusier. This is one of Le Corbusier's most famous buildings and a fascinating example of modernist architecture. I signed books at Librairie Imbernon, which is the bookstore in Unite d'Habitation Le Corbusier, and attended the exhibition of my work and the work of French artist Phillipe UG at Alcazar. It appears that pop-up is very popular in France at the moment, which makes me very happy. Eating oysters and Coquilles St Jacques with Evelyne, Aurélie and Anne-Céline at Lutetia. Fruits de mer in Montparnasse. With Marion Bataille and Alix at La Boutique du Livre Animé. 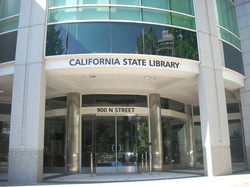 Saturday October 13th was a nice warm day for an outdoor pop-up event at the California State library in Sacramento. We had a good attendance and as you can see in the photos, all the children were very creative with their pop-ups. I would like to give special thanks to Rebecca Fontaine from the California State Library for hosting the event and a big thanks to Gene Larson for sharing the special collection at the library. 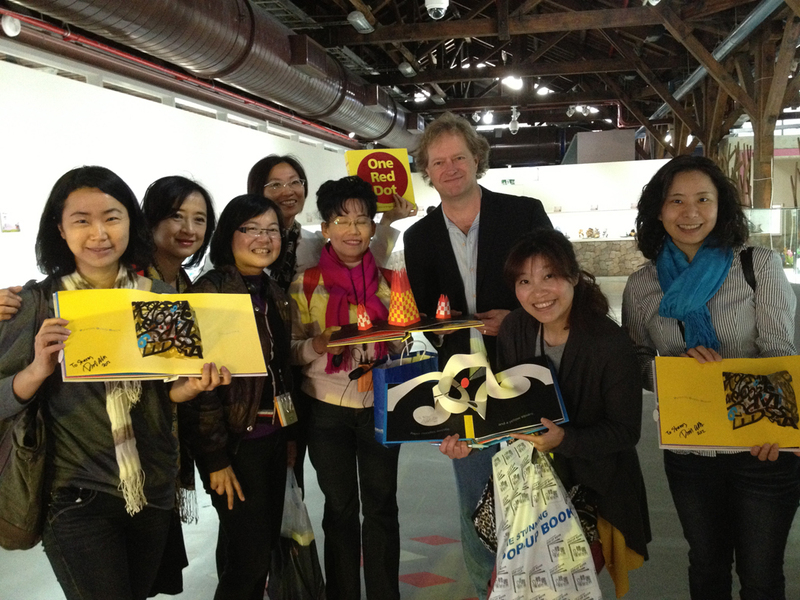 We all worked hard making pop-ups. 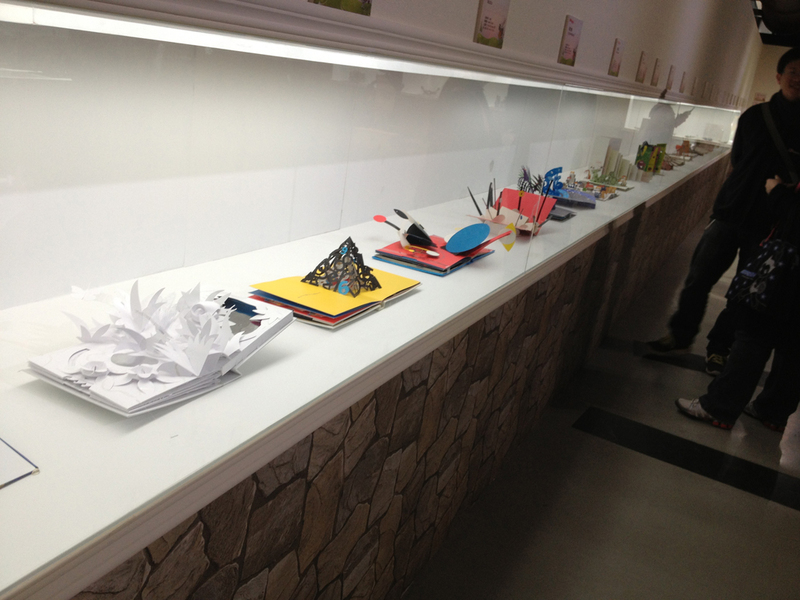 The kids made very creative creations. I signed a lot of books. and make a simple paper pop-up. 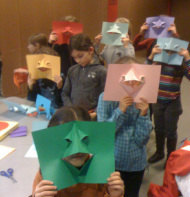 The children were enthusiastic and quick to learn the art of basic paper engineering. 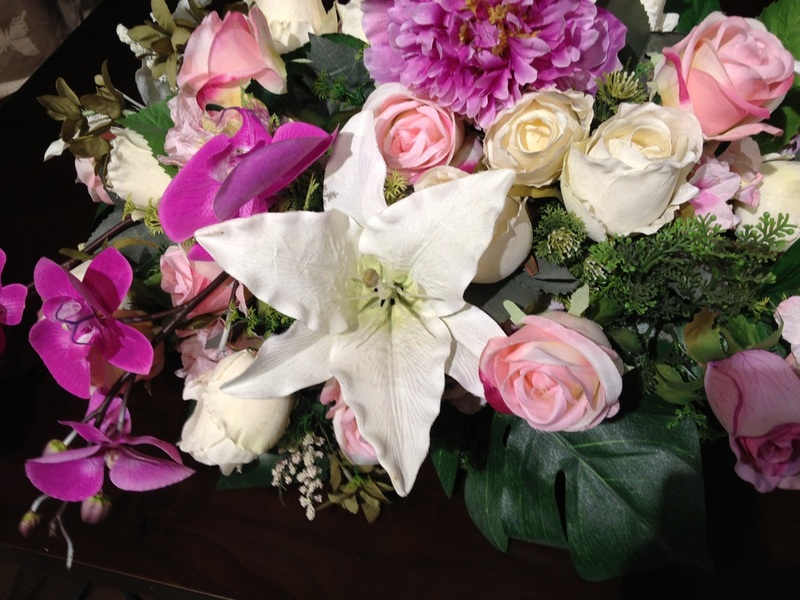 Thank you to all who came out to visit. This is the blog of artist David A. Carter.